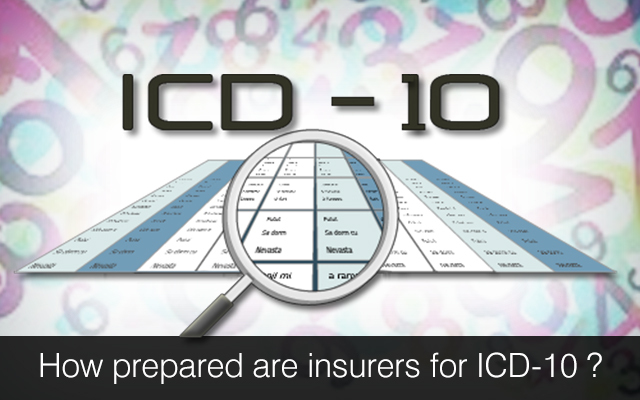 How prepared are insurers for ICD-10? ICD-10 is the tenth version of revision done by the ICD or International Statistical Classification of Diseases and Related Health Problems. It is actually a list of medical classification that is done by the WHO or World Health Organization that codes various diseases, their signs as well as symptoms, abnormal findings, complaints along with social circumstances, external factors causing diseases as well as injury. ICD1-10 that is set to be implemented on and from 1st October 2014 is likely to surpass the 1999-2000 Y2K issue buzz that had rocked the world. However, all the insurance service providers are getting prepared for the deadline and are confident to get ready to face the new format of claim processing. However, before we discuss the preparedness of these insurance service providers let us briefly discuss how the changeover is likely to affect the proceedings. This changeover, that can be compared to the Y2K system upgrades way back in 1999-2000, will make it imperative for the health insurance plans to deal differently with various business processes along with staffing. Reviewing the existing technology for understanding various affected areas. Conducting a typical operational assessment for seeing the business processes that will be affected by this trend. Conducting an assessment for taking stock of the people who will need ICD-10 training. Conducting strategic assessment for determining the way the company will adopt when it comes to handling ICD-10 along with reviewing the efficacy of each option. Now coming to the extent of preparation by the insurance service providers to counter ICD-10, certain recommendations have been framed by the AAFP or American Academy of Family Physicians. In order to comply with their recommendations, the insurers are in the process of taking the following precautionary steps or better to say, steps of readiness. They are going to confirm that the evaluation of internal products and the processes thereof are complete. They will be acknowledging that the ‘upstream’ testing of the data as well as processes that are incoming from the clearing department and other health related IT companies whom they have entered partnership with. At the same time they will guarantee that the process is complete and foolproof. The will identify the number of provider groups that have submitted or have planned to submit claims for testing the ‘downstream’ process. Share problems and issues that the testing or evaluation has revealed. Guarantee the availability as well as the feasibility of the contingency plans that have been chalked our to take care of the problem areas. Provide various opportunities of multiple testing of the claim testing practices. Reveal multiple plans to resolve various intricate post-implementation issues. Identifying the touch points of the current system as well as the work processes that are currently using the ICD-9 codes. Discussing with the Vendors of PMS or Practice Management System regarding ICD-9 code recommendations. Discussing plans of implementations with all the clearing houses and billing services to guarantee a smooth transition. Assessing the need of staff training. So a majority of these insurers is coming up with a series of webinars to be able to answer questions raised by the physicians. They are also restructuring their infrastructures to make sure that the facilities along with the brick and mortar offices would take care of any issue(s) pertaining to the at-risk claims. Healthcare it development teams can help you build projects within allocated budgets and time schedules. This Post was posted in Health Care and tagged Clinical software development, develop medical billing software, EMR EHR Software development, healthcare it development, healthcare it services, healthcare mobile app development, healthcare software integration, hire healthcare software developers, iphone healthcare app development, mobile health app development. Bookmark the permalink.